Shadow Kiss (Vampire Academy, book 3) by Richelle Mead. Rose Hathaway knows it is forbidden to love another guardian. Her best friend, Lissa-the last Dragomir princess-must always come first. Unfortunately, when it comes to gorgeous Dimitri Belikov, some rules are meant to be broken. But since making her first Strigoi kills, ROse hasn't been feeling right. Something dark has begun to grow in her mind, and ghostly shadows warn of a terrible ecil drawing nearer to the Academy's iron gates. And now that Lissa and Rose's sworn enemy, Victor Dashkov, is on trial for his freedom, tensions in the Moroi world are higher than ever. Lying to Lissa about Dimitri is one thing but suddenly there's way more than friendship at stake The immortal undead are on the prowl, and they want vengeance for the lives that Rose has stolen. In a heart-stopping battle to rival her worst nightmare, Rose will have to choose between life, love, and the two people who matter most..but will her choice mean that only one can survive? Dhampir Rose Hathaway is learning that being a Guardian doesn't always mean she can protect them all. Shadow Kiss is the most emotional Vampire Academy book yet. This book was amazing and yet heartbreaking. There is so much growth amidst the main characters and yet this maturity and sense of purpose comes with a price. 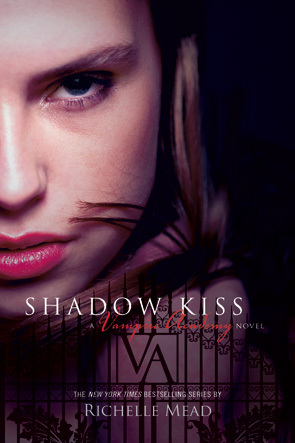 The end of Shadow Kiss leaves you on a precipice longing to take the plunge into Blood Promise (Vampire Academy, book 4). I recommend Shadow Kiss (Vampire Academy, book 3) to readers of paranormal, paranormal romance, young adult, thrillers, urban fantasy, action packed vampire fiction and especially to fans of the Vampire Academy series. Visit my review of Vampire Academy (Vampire Academy, book 1) here and Frostbite (Vampire Academy, book 2) here. Shadow Kiss on Amazon . Hope you read it soon and enjoy it!